It was the morning of December 17, 1903. The temperature at Kill Devil Hill, North Carolina was a chilly 34ºF. Wilbur and Orville placed a red flag on the side of their camp to signal the U.S. Lifesaving Station one half mile away that they needed assistance. Responding to the call were three Lifesavers, John T. Daniels, A. D. Ethridge, and W. S. Dough. Joining them on the walk to the Wright brothers’ camp were W. C. Brinkley, a farmer from nearby Manteo, NC, and Johnny Moore, a 17-year-old from Cholowee, NC, visiting the lifesaving station. 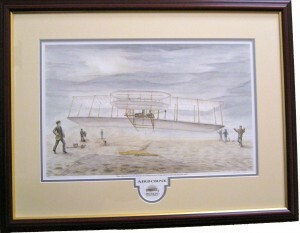 Together these men comprised the ground crew of the world’s first flight. Engine: 12 hp, gasoline powered, 4 cylinders, weighing 170 lbs. #2 Wilbur – pilot, 12 seconds, 175 ft.
#3 Orville – pilot, 15 seconds, 200 ft.
#4 Wilbur – pilot, 59 seconds, 852 ft.